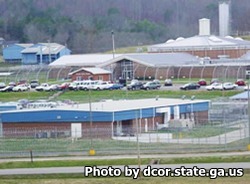 Walker State Prison is located in Rock Spring Georgia. It is a medium security institution that incarcerates adult males who have committed felonies. Currently the capacity of this facility is about 444. Inmates are housed in twelve open dormitories. This facility is also responsible for housing about 200 probation violators. A residential substance abuse treatment program known as RSAT offers individual and group therapies for those who suffer from addiction. Vocational opportunities include working in laundry, the warehouse, maintenance, as an automotive mechanic, culinary arts, barbering, and metal fabrication. Some inmates from Walker State Prison are selected to work outside of the institution in a supervised work detail for various county agencies. Inmates can also participate in religious activities including worship and prayer offered by the Chaplains office. Visiting is on Saturdays, Sundays, and State recognized Holidays from 9am-3pm.